The correct name of the operator in Lismore is Simes Bros.Coaches. 1314 is now Regd BS00CR with Dineen Group Victoria. 7218 MO is already on list. But 7923 and 7924 will be added. LB608 wrote: 7218 MO is already on list. But 7923 and 7924 will be added. The fleet number has been added as well. 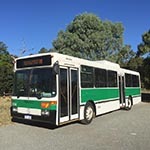 Rottnest Express has two NHs - ex-TP1730 (1GSI 111), and there's an image on their website of the second one, 1GRX420, which I heard is ex-TP1739. Adelaide's buses still have a 25 year maximum life. The NHs being withdrawn in Perth are between 18 and 20 years old so still have quite a few years left.